It is a fully automated trading Expert Advisor, whose algorithm is based on trading using pending orders at the high and low of the daily working channel. StopLoss and TakeProfit are set manually by the trader, which provides ample opportunities for Expert Advisor optimization. 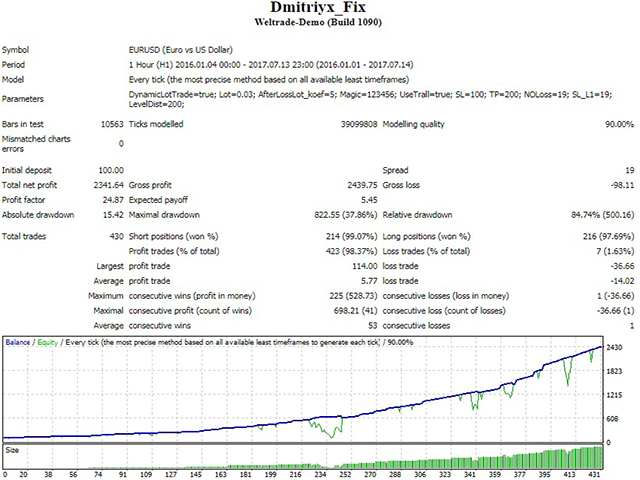 When the UseTrall function is enabled, the EA only uses TakeProfit without setting a fixed StopLoss level. Upon reaching the specified profit target level, the EA sets StopLoss at the specified NoLossLevel distance from the open price taking into account spread, which sill be used as the main target. 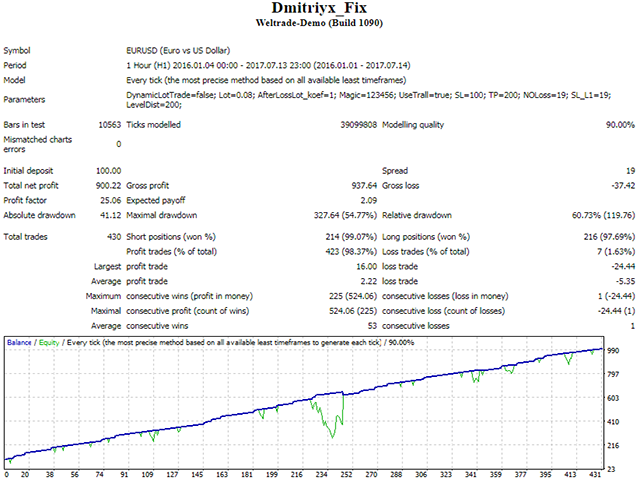 If the price goes further in the favorable direction, the profit is fixed by a manually set TakeProfit level. The EA algorithm includes a dynamic lot calculation function, which allows to automatically increase trading lot in accordance with the deposit growth. Additionally, in case the previous trading operation was losing, the EA will increase the next operation lot by applying the AfterLossLot_coefficient ratio, in order to cover the loss. Ready to go without any particular setup. Conservative settings are set by default. More aggressive trading parameters are described in the attached screenshots. It is possible to trade in fixed or dynamic lot mode. Optimized to work with EURUSD H1. Works on Standard and ECN accounts. Easy to use, no complex settings. It does not use Martingale. Has a built-in mechanism for covering loss of the previous operation. Allows starting with a deposit of 100 base currency units with conservative settings. MarketFilter - filter for performing trading operations. (0-off/1-on). There will be more trades with the filter disabled, but the drawdown will be much higher.